I’m scared to go back to Starbucks and order anything other than a black coffee, OK? I mean, you’ve seen the back-and-forth, the “ummm, so they use a vacuum on the pastries and the espresso machine” comment, and also the lack of willingness to be 100% clear about the presence of allergens. So scared that I haven’t even dipped my tongue into the steamy flavors of the season. This, I don’t like. I want some flavorful espresso drinks my friend, but I’d rather not poop immediately after, ya’ know? So I’ve set about to make my own gluten-free Starbucks drinks, and especially the magical, seasonal, pumpkin spice latte. It wasn’t going to be easy; after all you’ve got to make sure Trader Joe’s is all stocked up with pumpkin pie spice, make sure you can either roast a pumpkin and puree it up, or alternately, get some good organic pumpkin puree. 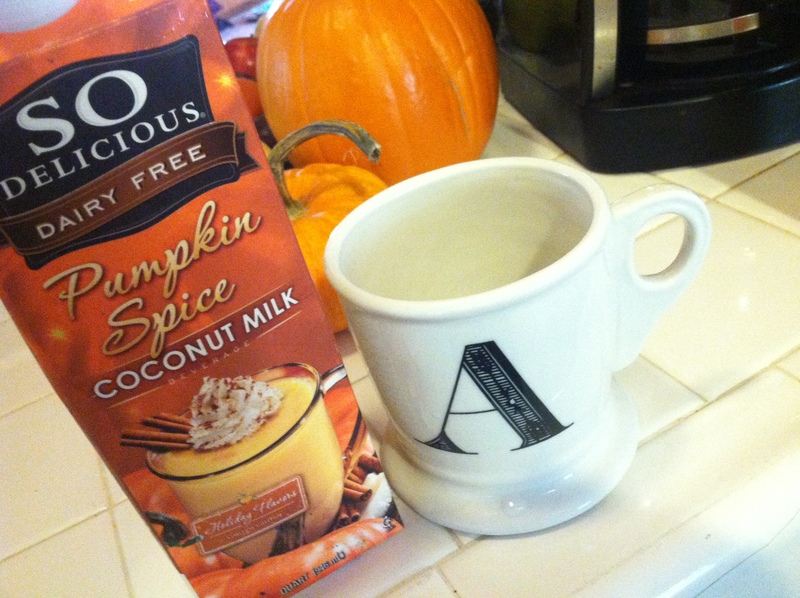 But as you can see, the lovely people at So Delicious sent me this delish coconut milk with a pumpkin spice kick. 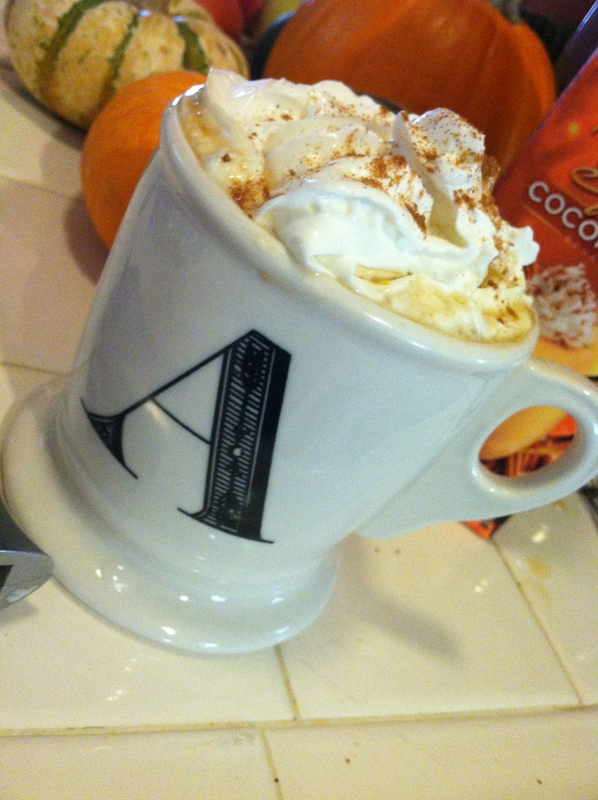 This makes making the GF DF PSL like a zillion times easier. A zillion. Still, if you want to kick it up a notch you’re going to want to add in a bit of extra spice. Pumpkin spice. Oh, and some sweetener. I used honey but you can go with whatever floats your boat. And don’t forget the non-dairy whipped topping (there’s a soy version if you swing that way) and you are in fall coffee drink business, but without those things that make you sick. WIN. You wanna’ know how this works? 1. Brew up your strong coffee or espresso and keep it hot. 2. In a small bowl combine 1/2 cup So Delicious Pumpkin Spice coconut milk, honey, pumpkin puree, vanilla and 1/2 teaspoon pumpkin pie spice. Whisk until thoroughly blended together. Pour coffee into large mug, and add coconut milk mixture. 3. Pour the rest of the coconut milk into a large cup or narrow container. Using a milk foamer (or a very strong arm and a whisk for a long time) beat milk until foamy. Add milk foam on top of coffee. 4. Top with non-dairy topping and sprinkle with pumpkin pie spice and cinnamon. Tags: dairy-free, dairy-free starbucks, gluten-free starbucks, pumpkin spice latte, vegan. Bookmark the permalink. Previous post ← Oh Hey, Another Gluten-Free Box + Giveaway! UPDATE! Unfortunately they don’t carry it in m area of the world ((so sad)). I hit every grocery store in town last night. OH no! I’m wondering if you can order directly from the source. Oh. wow. I need to try this, like, now…. YUM, want want want!!! I need to find some of that Pumpkin Spice Coconut Milk.